The oldest surviving Byzantine monument in Istanbul, Küçük (“Little”) Hagia Sophia, formerly the Church of Sts. Sergios and Bacchos, was constructed under the Byzantine emperor Justinian near the southern city walls on the shores of the Sea of Marmara in A.D 527–536. The plan of the church is an irregular rectangle with a narthex along the west side and a half-hexagonal apse projecting out on the east. The remaining irregular square hall in the main body has eight polygonal piers which border the octagonal nave expanded with four semi-circular niches towards the corners. 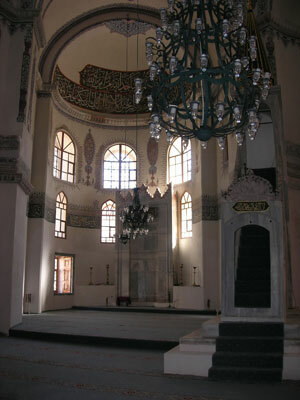 In 1504, the building was converted into a mosque and a portal was added in front of the west walls. In the 1950s, the area in front of the city walls near the building was claimed from the sea and the new land opened to traffic. A major railway was later built next to the building. The mosque and its cloister were restored in 1996, and until it was closed for repairs in 2002 continued to be used for religious purposes. Cracks visible in the dome have been caused by environmental changes and natural disasters, including the earthquake of 1999. These have allowed rainwater and dampness to affect the building, which have in turn exacerbated the damage to the dome. The foundation was raised 20 centimeters in the 1970s to combat rising damp. Differential settlement of underlying soil, however, has caused additional problems, as it is subjected to constant vibrations from the nearby railway and road. Construction of a new sea wall nearby also raised the water table and affected the foundation of the mosque. Since listing the site in 2002, the Municipality of Istanbul, the Ministry of Culture, and the Pious Foundation have come together with an ambitious plan to completely restore the building, addressing both the cracks in the dome and the soil differential. During an early phase of work, tombs were discovered underneath the site, causing reexamination of the direction of the project. International experts have thus far been barred from viewing the restoration. Due to this situation the site was re-listed on the Watch in 2004. Küçük Hagia Sophia Mosque appears here again in the hope that relisting will help keep the spotlight on this most significant site and the challenges it faces as it undergoes a stabilization project lead by the Municipality of Istanbul.